Of all CBS' fall premieres, none was as important to the network's future than last night's debut of The Late Show With Stephen Colbert. While it's far too early to judge Colbert's Late Show prowess based on a single show, Tuesday's fun, inventive premiere proved to be a solid debut for the new host, and it left CBS with several reasons to be thrilled (and relieved) about its late-night fortunes with Colbert at the helm. Advertisers can't get enough. The Late Show With Stephen Colbert brought in a slew of big advertisers, including automotive (Ford, Dodge, Lincoln and Mercedes-Benz), tech (Amazon Echo) and, biggest of all, entertainment. The show included spots for seemingly every major fall film, including five separate movie ads during a single break (The Martian, Maze Runner: The Scorch Trials, The Walk, Hotel Transylvania 2 and Sicario). He's already doing brand integrations. CBS president of network sales Jo Ann Ross had been champing at the bit to get Colbert involved in integrations asap, and she got her wish the first night, as Colbert obliged with an extended product placement segment for Sabra. And per Colbert's declaration that any integrations would have to be "authentic and in his own voice," the Sabra placement was appropriately off-kilter, with Colbert explaining that he "swore a blood oath" to the cursed amulet on his new set, which forces him to "make certain regrettable compromises," i.e., talking up Sabra roasted red pepper hummus and grab-and-go snack packs. Later in the show, Colbert also did an lengthy bit about Oreos, comparing them to Donald Trump jokes and his inability to make (and eat) just one. That wasn't product placement; it was just Colbert being Colbert, riffing on Trump's recent announcement that he was swearing off Oreos. By the end of the segment, he's stuffing his face with them. 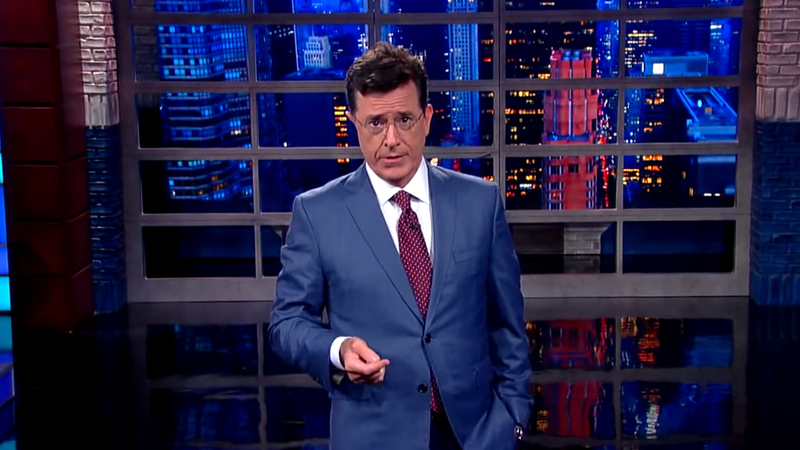 But it's clear from Night One that brands have a new late-night ally in Colbert. CBS finally has an energetic 11:30 p.m. host again. While Colbert was perhaps too amped up at times—of course, being sidelined for nine months will do that to a performer—CBS had to be thrilled with seeing an 11:30 host with energy to spare, especially after Letterman's final, low-key years. He lured Jon Stewart back to late night. While a Jon Stewart cameo seemed likely, we ended up with three. He capped off Colbert's "Star-Spangled Banner" intro (where Colbert sang the national anthem in various locations around the country) by pulling off an umpire mask and yelling, "Play ball!" Stewart's picture popped up at the end of the show, taped to Colbert's locker (more on that below), but the most surprising Stewart appearance was saved for the end: the closing credits revealed that he is now a Late Show executive producer. That's right, just a month after stepping down from The Daily Show, Stewart once again is a force in late night. He's a gracious host. Colbert paid homage to two important CBS titans, including Late Show predecessor Letterman. Calling himself a "first-generation David Letterman fan," Colbert vowed, "we will try to honor his achievement by doing the best show we can and occasionally making the network very mad at us." He also gave his new boss—CBS Corp. chairman and CEO Les Moonves—a featured bit, in which Moonves kept threatening to switch back over to the Mentalist repeats that CBS ran at 11:30 during the summer months. Even as the Late Show and Tonight Show have found themselves in the midst of a booking war, the hosts at the center are playing nice. Jimmy Fallon appeared on the program to wish Colbert well (Colbert in turn said he'd be TiVo-ing The Tonight Show for later), while at the show's end, they changed and celebrated a job well done in the late-night locker room. As Colbert said last month: "Fighting between the hosts doesn't sound funny. There's no joke there." He hasn't abandoned The Colbert Report. While Colbert has retired his "Stephen Colbert" persona from The Colbert Report, his first Late Show appearance featured several nods to his previous show. He said, "Hello, nation!" at the beginning, and the Captain America shield from his Colbert Report set has a prominent position in his new TV home. Colbert also mixed in several references to his old job, including: "I used to play a narcissistic conservative pundit. Now I'm just a narcissist." And his Trump/Oreos segment felt very Colbert Report-esque. In other words, many of the best parts of Colbert's old show will find there way into the new one. He's not reinventing the wheel, just giving it some new spins. While Colbert was keeping his show's format under wraps during the summer, judging by Tuesday's premiere, he's going to stick to most of the familiar talk show staples: a monologue, guests, remote segments, an announcer (even if it was Colbert himself). Colbert might be drawing outside the lines, but the lines still exist—this is, after all, CBS. He'll have fun with his celeb guests. Like Fallon and Jimmy Kimmel, Colbert won't simply be going through the motions with his A-list guests. He convinced first guest, George Clooney, to promote (and film scenes for) a fake movie called Decision Strike—which looked better than a few of Clooney's real movies. Colbert also engaged Clooney in a conversation about Darfur that didn't seem overly pretentious. It was a more candid chat than we've seen from Bush in some time and instantly makes future visits from politicians (starting with vp Joe Biden on Thursday) that much more intriguing. He's widening late-night's musical horizons. Jon Batiste looks to be an inspired choice as bandleader, and Colbert closed the first show with an atypical, fantastic musical performance: a lineup of "very special friends" that included Mavis Staples, Ben Folds, Derek Trucks, Buddy Guy and Colbert himself teamed up for Sly and the Family Stone's "Everyday People." While Colbert still has a long road ahead of him, he and CBS have to be thrilled with his first steps last night.